Warm chocolate chip cookies, creamy peanut butter and chocolate cups and rich gooey brownies are a few of my fantasies. With my new clean eating initiative, I am not saying goodbye forever, but I am taking a little hiatus from my love affair with chocolate. Luckily I've found a substitute and before you shake your head in disbelief; I've fooled more than one with this easy to make dessert. Blend until smooth. It will take a while and you need to stop and scrap the sides to allow everything to combine. Once done you will have a very sticky, caramel like substance. 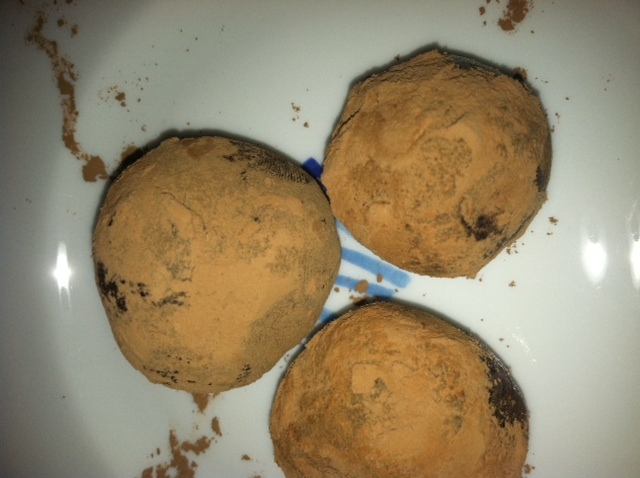 Roll into balls and roll into Cacao powder or chopped nuts. These are very sweet and there is no added sugar. If you do not think you enjoy dates, try these you might be surprised like I was. I now know why dates are referred to as nature's candy. More than one family member thought they were fudge balls and my son can't get enough of them. How do you satisfy your sweet tooth without eating chocolate or sugar? These look so good! I'm going to try it!